This book is in three parts: The Basics, Brewing Traditions, and The Last Word. Part Two is by far the largest section of the book, 281 of 383 total pages. Each section here consists of a bit of history of the style, a section on the style with food, and a list of notable producers with descriptions of specific beers and their pairings refined even further. The are four color photo sections with gorgeous photos of brewhouses, regional specialties with their accompanying beer, and so on, throughout the book. There are also lots of black & white images throughout the book. Chapter 3 on the Principles of Matching Beer with Food contains the following sections: Aroma; Beer Styles; Impact; Carbonation; Bright and Dark; Bitterness; Malt, Sweetness, and Caramelization; Roast; and After Dinner—Matching Desserts and Cheeses. “Paying that little bit of attention, both to your food and to your beer, is the difference between having an “OK” culinary life and having one filled with boundless riches of flavor. Learn a little bit about the amazing variety and complexity of flavor that traditional beer brings to the table, and in return I promise you a better life. I’m not kidding—it’s that simple” (39, emphasis in original). The Aroma section gives us lots of words for the various aromas that come from beer ingredients and other foods but the gist is that, “Harmonizing aromatics between the beer and the food is one of the guiding principles of matching. There’s far more to beer than its aroma, but your nose will often lead you in the right direction” (44). The Beer Styles section emphasizes determining style as “… style describes what the beer tastes like, what the aromatics are like, how strong it is, what sort of body it has, how it was brewed, and even what its history is” (45). There is a cheat sheet provided on the facing pages of 46-47. 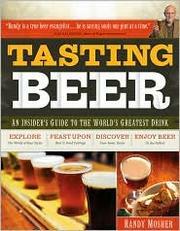 “”Cheat Sheet”: Beer Styles and Flavors” provides quick, useful information, such as Bitter is “Fruity and racy, subtle, low carbonation, robust hopping” where IPA is “…, amber, strong, dry, robust hop bitterness and aroma” (46). There are approximately 40 styles elucidated via this shorthand on these two pages. Impact is the section where we get, in a sense, the most information. First up, “When we are matching beer and food, the most important thing we’re looking for is balance. We want the beer to engage in a lively dance, not a football tackle. In order to achieve the balance we seek, we need to think about the sensory impact of both the beer and its prospective food partner. “Impact” refers to the weight and intensity of the food on the palate” (49). What follows this is a several paragraph “thought exercise” discussing various beer and food combinations that help elucidate further what is meant by impact. Carbonation tells us that “In finished beer, carbonation gives beer a refreshing lift, concentrates bitterness and acidity, and cleanses the palate. It also lifts the beer’s aromas right out of the glass and presents them to your nose. … The carbonation in beer lifts and scrubs strong flavors from your palate, leaving you as ready to enjoy the next bite as if it were the first” (50). On the next page, Oliver discusses the range of carbonation and how that works with assorted food choices. In Bright and Dark we learn that “Brightness refers to a dry briskness on the palate, sometimes with a refreshing zip of acidity. It also refers to citrus or apple-peel aromatics, sometimes from the yeast strain used, but also from some hop varieties. … Darkness refers to roasted flavors such as chocolate, toffee, caramel, and coffee, as well as the flavors and aromas of dark fruits such as plums, raisins, and olives. Sweet spices such as cinnamon and nutmeg belong here too; this is one reason they are often added to stews. Mushrooms are a dark flavor …” (52). For Oliver it is still all about “harmony” (52). We also get the highly applicable admonition to “Let’s not confuse bright and dark flavors with light and dark colors, though,” as they are not the same (52, emphasis in original). Often a dark beer has a dark flavor and vice versa with light but this is definitely not always the case! Under bitterness, we get a discussion of the Italian love of bitterness to start and end a meal, for instance, with something like Campari as an aperitif and a sharp espresso to end it and how this contrasts with Americans’ general distrust of bitterness. “Well-hopped beers have the ability to cut through heavy sauces, fats, and oils, leaving the palate cleansed and refreshed rather than stunned” (54). Also critical to understand regarding bitterness in beer, Oliver tells us that “Hops are not the only ingredient that can lend bitterness to a beer. Roasted malts can also add their own bitterness—just as espresso has a roasted bite, so does an Irish stout, and only partly from the hops. In beer, bitterness is focused and accentuated by lowering serving temperatures, higher carbonation, and a low residual sugar content. Conversely, malt sweetness, warmer serving temperatures, and lower carbonation will temper bitterness” (54). In Malt, Sweetness, and Caramelization we are told that “The warm, breadlike flavors of grain are more prevalent in some styles of beer than others, making them better companions for certain foods. Malty beers tend to be full-bodied and round on the palate” (55). Perceived sweetness, which is a corollary to malt, depends on four factors: residual sugar, bitterness, carbonation and serving temperature (55). Oliver does a good, succinct job of how those work together and individually affect the beer to generate a perceived sweetness. Roast expounds on the flavors of roasted malts—primarily across the wide ranges of coffee and chocolate—and how they work with foods. Desserts and Cheese round out this chapter with some specifics on those topics. I jumped into a lengthier discussion of this section since, at heart, it should be the core of the book. Alas, I fear it is not. I do believe that Oliver has done a good job overall but it is spread far more throughout the book than concentrated here. Much of what you need to know to pair well is in those detailed style and specific exemplar pages. Some of the books that have followed this pathbreaking one have done a better job of providing the basics of how to proceed on your own versus the main gist of Oliver’s pairing knowledge being passed on in the style sections, such that the reader must piece more together. Then again, “shoulders of giants” and all that. For instance, Mirella Amato in Beerology, does a fine job giving one lots of angles from which to explore while giving the subjectivity of individual taste its due. Randy Mosher also does a wonderful job in a short amount of space in Tasting Beer, which I highly recommend overall. Both authors give credit to Oliver, as they should. Another writer, also respecting Oliver, who does a fine job on the topic in a short space is Jeff Alworth in The Beer Bible. Another early beer and food writer given her due by many is Lucy Saunders. We have, and I have read, her 2013 Dinner in the Beer Garden, which we helped crowd fund. This is more of a cookbook with little in the way of principles but one could learn from it, albeit more slowly perhaps even than Oliver. Saunders has also written Cooking with Beer (1996), Grilling with Beer (2006), and The Best of American Beer & Food (2007), sadly none of which I have seen. The other writers often bring in the idea of “contrast,” which is an important idea. For Oliver it is (or was) all about the harmony and balance, which is a great place to start but not the only way to go. I am also hearing really good things about Julia Herz and Gwen Conley’s Beer Pairing: The Essential Guide from the Pairing Pros but I have not seen it yet. I am looking forward to it though. On cheese and beer pairings I doubt that you can do better than Cheese & Beer by Janet Fletcher. The best way to proceed may be to peruse one or more of these books and choose a point or two of entry and bravely venture out with (or without) any firm guidance and experiment. Remember to record and grow your experiences from there. They are your taste buds and your palate, after all. No one can tell you how things taste but you. “The harmony between stouts and chocolate desserts is so big and so wide and so obvious that every restaurant that serves desserts should have at least one stout on its list. If you get only one thing from this book, make this point the keeper—stouts are an absolutely perfect match for chocolate desserts” (144, emphasis in original). Beer with Food: A Reference Chart is a 7-page quick listing of beers that go with specific foods, ranging from Aioli to Wild boar. Highly recommended but perhaps not as the first book one peruses on the topic. I feel you can get an easier and quicker start by digging into the short chapters in Mosher or Amato (see above), or others. Oliver is the book you’ll turn to to get a deeper appreciation but one which you’ll have to cull from the entire book. Tuesday night, along with some friends, we attended Deschutes Brewery University (DBU): Winter Beer and Cheese Pairing, which was a joint production of Deschutes Brewery and Tumalo Farms. Our hosts were brewer John Abraham and cheesemaker Flavio DeCastilhos. They paired 6+ winter beers with 6 cheeses from Tumalo Farms and then told us a bit about each of the beers and cheeses as we sampled them and then chose to sample whichever cheeses (and other small nibbles) with the beers as we saw fit. The reason I said 6+ is that they could only find 3 bottles of the Fantôme de Noël which meant only a half pour each so they added a 7th beer, Duchesse de Bourgogne, and gave us a pour of that too. These two were beer(s) 2A and 2B in the list. 3 St. Bernardus Christmas Ale from Brouwerij St. Bernardus in Watou, Belgium. Since my notes on the cheeses are so poor, let me say upfront that every one of these cheeses is exquisite! I will certainly be looking for Tumalo Farms cheeses more actively in the future [and I did link them all above]. 7.3% ABV, 70 IBUs. Grapefruit, pepper, light caramel. Goat’s milk and Deschutes Mirror Pond Ale. The Pondhopper really brings out the hops in the Abominable, which also paired nicely with the Rimrocker. The Nocciola really brought out the grapefruit in the Abominable. 10% ABV, barrel-aged, assorted spices. Grapefruit smell. Failed to make any notes about the Jewell, which should not reflect on its taste. Aged in rum barrels. Cherry, vanilla, oak, green apple, rum. Tastes a fair bit like a green Jolly Rancher. Tastes quite good with dried apricot. They had us take a small bite of the pickled ginger at this point to clear our palates. Ugh! 10% ABV, Belgian strong ale. Boozy dark fruits, clove, cinnamon, oak. Again, failed on cheese notes. The St. Bernardus was really mellowed by the Jewell. Was quite good with several of the cheeses (think I tried it with 4), although most, except the Jewell, didn’t affect the taste of the beer much. 10% ABV, Belgian strong ale. Berries, plum, figs, raisins. 100% goat’s cheese, cave-aged for one year. Very nutty. The Classico Reserve really mellowed out the Fantôme de Noël in a very good way and was also good with the Duchesse de Bourgogne. 10% ABV., 100% pinot barrel-aged for 6 months. Well-balanced hops & malts. A really good pairing, sweetens the beer. Super Jubel also quite good with the cracker with figs. 11% ABV, 70 IBUs, Italian brewer’s licorice, blackstrap molasses, dry hopped with vanilla beans and cherry bark. Fenugreek seeds. Hints of butterscotch at the finish. The Abyss and the candied walnuts = O.M.F.G. I apologize that my notes are so poor for both the cheeses and the beers. I am new to this level of studied appreciation and lack some of the vocabulary and still have a fairly undeveloped palate; all of which I am trying to remedy quickly. It is also quite hard to pay full attention to whoever is providing you info and taste beers and cheeses (or whatever food) in assorted combinations and keep up with it all. Also, after a while, several small glasses of strong beers begin to take their toll. My first goal in all of this is to pay as full attention to the experience of tastes and aromas as I can, and only secondly to worry about notes. I will say that all of the beers and cheeses were quite good, as were the pairings set up by John and Flavio. I gave the first 5+ beers all 4 stars and based on some of the cheese and other foods paired with The Abyss (2012) I gave it a 5 star rating for the first time. I am still a long way from considering it the Best Stout or Porter in the world but it is still an amazing beer with lots more potential than I suspected [see my previous notes on The Abyss here and here]. I’m telling you, The Abyss and candied walnuts! We would like to extend a definite “Thank you!” to John and Flavio who did an excellent job hosting this event. Feel free to do some other pairings in the future for us! This was Sara’s and my 3rd DBU and we are looking forward to many more! See you there!